Why doesn't anyone make an H1 steel bicycle? Location: Videogames ruined my life. Good thing i have 2 extra lives. Bikes: Giant TCR2, Giant TCX, IRO BFSSFG SE, Salsa Casseroll, IRO Rob Roy. Why isn't H1 steel (or similar) used for bicycles? Or are only certain steels suitable for bicycle tubing? But perhaps there's another similar steel out there suitable for bicycle frames? A girl once asked me to give her twelve inches and make it hurt. I had to make love to her 3 times and then punch her in the nose. 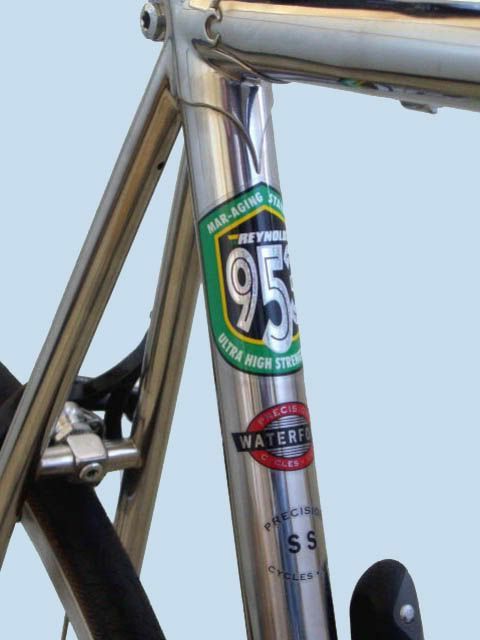 There are some builders using Reynolds 953, which is a stainless steel. Very pricey, and hard to work with I think, but very nice. 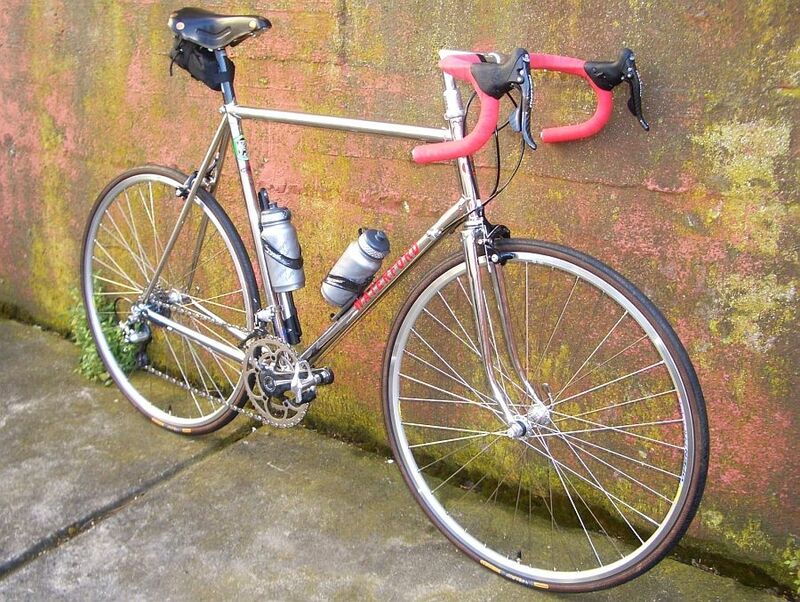 You can get stainless lugs, too, and have an all-stainless lugged frame. I'm a knife guy, too, and I suspect many of the properties that are important for a blade (ability to hold an edge, easy to sharpen, etc.) don't really apply to a bicycle. In contrast, a bike's frame is its suspension (no, it's not the wheels) so absorbing shock and transmitting energy are important; I've never heard those qualities mentioned in connection with a knife. Also, the steel must be conducive to welding and/or brazing or soldering without losing the desired qualities. I am sure there are more examples, but I'm beginning to bore even myself. I'm carrying a Boker Trapperliner w/ smooth red bone scales today; how about you? For starters, it seems to be a proprietary material from one mill, probably not available in tubing form. "Work hardening" wouldn't affect ride qualities. I would be doubtful as to it being "completely rustproof" myself. As you cut the carbon content of a steel down, I'm not aware of any great rise in rust-resistance. ...I'm carrying a Boker Trapperliner w/ smooth red bone scales today; how about you? It's extreme rustproof-ness has been proven in testing by many people on other knife forums (we're talking aquariums with agitated saltwater baths for weeks on end that would destroy other blades). Seriously, the stuff is awesome. I have one folding knife (Spyderco Salt) which is still rust free that i'd put in my pocket when going to the swimming pool and would never rinse/clean it. As well biked says, Reynolds 953 stainless steel tube sets are used with stainless lugs and bottom bracket shells to build rustproof frames. 953 was introduced by Reynolds in late 2005 and an increasing number of framebuilders are building with it as they gain experience with the material. Columbus has also introduced a stainless steel tube set, XCr, and a number of framebuilders are beginning to use it as well as 953. Carl Strong, for example, has built both 953 and XCr frames. I think a pic of your beautiful lugged Waterford built of polished Reynolds 953 and polished "Newvex" stainless lugs would be in order. I just love seeing pics of that bike. Btw, a good friend of mine is ordering a Waterford, he's not going with stainless steel tubing, but he will be getting the polished stainless Newvex lugs. He's pretty excited. Since you twisted my arm. Your friend will love his Waterford! Rust resistance in H1 is entirely due to its 15% chromium and 6% nickel content. to do with rust susceptibility in steel alloys. Thank you. You saved me a lot of typing. The knife trade has more metalurgical folk tales and half-truths than even bicycles. Based on it's composition I believe H1 is an extremely corrosion resistant alloy similar to the 300-series stainless steels and suitable for marine use. It sacrifices hardness and edge holding for corrosion resistance. Scooper, what a nice & classy bike! How is the ride ? Thanks! Long rides are sheer ecstasy. It's six pounds lighter than my P15 Paramount, so it climbs better and accelerates faster. The key word is "carrying". (Except for maybe the Ontario) Randall is not really known for folders, and I get enough strange looks at the office without wearing a combat knife! I don't own one, I just helped my supervisor buy a few without his wife's knowledge (My credit card, his cash) and I got to hold them...only briefly, and for a moment, I understood. No carbon? Probably brittle. That's my guess. What do I win? Stainless is a great material but, it eats tools and you have to use a lot of heavy machine oil when cutting the tube set (coping) to make a better joint. The machine oil has to be completely removed before welding or brazing. The cost of the bike is very high as a result of the extra labor, dead cutting tools, and basic cost of the tubeset...all that said, I want one. All of that is true. Stainless steel tube sets are both very expensive and very hard on tooling. For less money you can get a Ti frame which will be lighter, even more corrosion resistant and just as strong. Ti is the hurdle stainless steel can't overcome. Combat or hunting, they are still too big to carry easily. Very nice knives, but not for EDC. For instance, today I have a German Eye (Carl Schlieper) single blade trapper w/ yellow scales; 3-7/8" long closed. Sharp as all get-out and totally unnoticed in my pocket. I wonder how the ride would compare between 2 comperable frames made of Ti and SS..? I was going to mention Ti, but was preceeded. Does anyone know of a Ti frame with track ends? Or an EBB, that would work, too, for me.